This is match from the 27th round of the English Premier league. 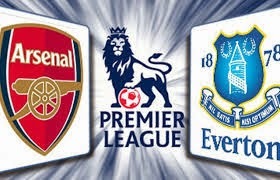 On the pitch we are going to see Arsenal, which are with record 14-6-6 and g.d. 49-29 on the 4th position and Everton, which are on the 14th position with record 6-10-10 and g.d. 33-37. Everton are one of the biggest disappointments this season, but they are handling well in the Euro cups. Arsenal are almost out of the Champions league and they will be fully motivated to win her. In the last three matches between those teams overall they were three goals scored and at least and my expectations are for the same to happen in this one. so we should expect not less than 3 goals here.